” ARE YOU CONTROLLING or IN CONTROL? This is a very important distinction! Whether you are controlling or in control of your life will make a very major difference in the quality of your health, your business affairs and all your relationships. If you have a thought that you must control your life or anything in it, then you are working very hard. And there is no reason to attempt to control anything! Think about that for a moment. 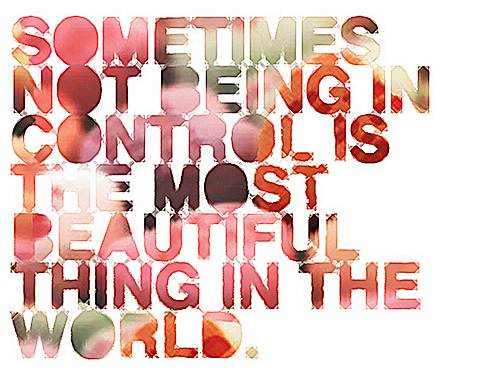 Can you control anything? do you have the power to control that your heart will be beating even two minutes from now? Of course not! But if you have not examined this subject, you may have a thought that you must control things. As you begin to trust your unconscious self more, you will be able to begin surrendering, willing to do your best and give it to the God energies. It’s okay to be ” in control ” meaning centred, poised, balanced and using your intelligence to achieve optimum results. ” CONTROLLING ” is when you have a thought that you have to do it by yourself or that you have to MAKE something happen or not happen. Control is a form of fear and is the opposite of love. if you have any doubt about this, just look around in your life and locate a person who is very controlling and see if you feel loved thereby. People turn to controlling instead of trusting life; somewhere along the line such people have made a decision that they are unsafe unless they control everything. Although that decision may have been forgotten, it is running the life of that person and demeaning the quality of his or her life experience. If you honestly investigate this, you will realise that it is not possible to control anything. Just shifting the way you think about this will help you to relax and become more effectively in control. EVERYTHING IS ALREADY PERFECT . . . . There is a vast and orderly intelligence at work in the Universe; it is functioning perfectly in your life, the chances are that you are controlling something – which is a way to keep the perfection away. You are, then, literally holding the perfection OUT! While it works to have a preference for a certain outcome, being ” attached ” to or insisting on having only a certain outcome is the way to disadvantage yourself. Allow these concepts enough room to notice how they are working in your life! Hi, I love the picture with the quote. Can I reblog it if I mention the source?